Parkinson's disease is a neurodegenerative disease that affects dopamine signaling neurons in patients' brains. Cell-replacement therapy shows some promise as a treatment for Parkinson's. A recent paper in the journal Molecular & Cellular Proteomics reports a technical advance in selecting cells to use in this therapy. Cell-replacement therapy involves differentiating stem cells into dopamine-signaling, or dopaminergic, neurons and transplanting them into a patient's brain to replace dying neurons. However, the variability of differentiated cells—including contamination with other neuronal cell types or residual undifferentiated stem cells —can affect transplantation outcomes. In clinical trials in the 1990s, for example, such contamination gave some patients severe dyskinesia, uncontrollable jerky movements that were worse than the movement problems caused by Parkinson's disease. To avoid interference by unwanted cell types, researchers need a differentiation protocol that yields a more homogeneous population of dopaminergic neurons. Researchers led by Hossein Baharvand, of Iran's University of Science and Culture in Tehran, and Ghasem Hosseini Salekdeh, of the Academic Center for Education, Culture, and Research in Iran and Macquarie University in Australia, set out to develop such a protocol. First, the team developed a special stem cell line that contains a green fluorescent protein, or GFP, reporter for a transcription factor involved in dopaminergic neuronal development. In undifferentiated cells from this line, the fluorescent reporter is not expressed. When cells begin to make the transcription factor, the first step toward becoming a dopaminergic neuron, they also begin to make the GFP protein. The team then used standard protocols to differentiate the cells and sorted them by GFP expression. They then identified proteins that were enriched on the surface of partially differentiated cells called dopaminergic progenitors. By selecting for one protein characteristic of dopaminergic progenitors, called contactin 2, they isolated progenitors and transplanted them into rats modeling Parkinson's disease. Rats that received transplants with contactin 2-enriched cells had better dopamine release, indicating that the transplanted cells were a better match for the dying neurons they were meant to replace. Sorting the cells also reduced motor symptoms of Parkinson's compared with rats treated that received unsorted cells. The team's isolation procedure uses may be an important step toward more successful cell-replacement therapy. A recent article in Molecular & Cellular Proteomics describes using new cell-surface markers to isolate a homogeneous mixture of dopamine precursor cells. The protocol may improve cell replacement therapy for Parkinson's disease. 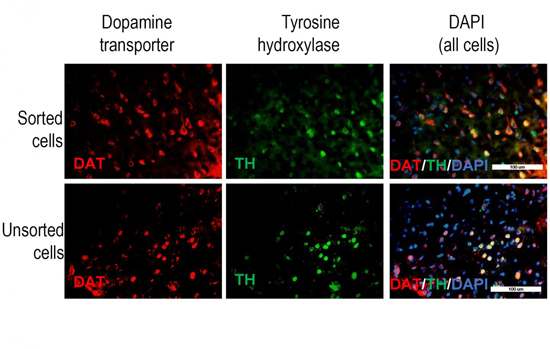 In this figure from the paper, the authors show that neurons induced from pluripotent cells that have been selected for expression of the newly described dopaminergic cell surface marker contactin 2 (top row) are more likely to express TH, an enzyme involved in dopamine production, and the dopamine transporter DAT, than unsorted cells (bottom row). Reducing the number of nondopaminergic neurons and neural progenitors in a transplant improved recovery in a rat model and is expected to reduce side effects in patients with Parkinson's. Photo credit: Fathi et al.